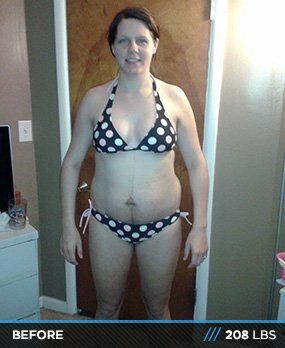 Body Transformation: Jenette Lost 43 Pounds Post-Pregnancy! Jenette's baby weight didn't stand a chance when she zeroed in and went to work. The 24-year-old had twins and stood onstage a year later in a bikini. See if you can outdo that! My pregnancy prompted my transformation, after I gave birth to twin daughters on June 12, 2012,. Before pregnancy, I competed in my first INBF women's figure competition in May 2011. I loved the entire experience; it was life-changing. To prepare for the competition, I went from being someone who never worked out to being someone who spent the majority of my time lifting weights, doing cardio, and learning about fitness. During my pregnancy, I exercised little. It felt like I took five steps back from where I was. My lack of exercise and the changes to my eating habits while pregnant resulted in a 55-pound gain. I had to get into shape and my goal was to compete again by the end of 2012. I reached that goal and competed in two competitions before the end of 2012 at the 2012 NPC Elite Physique (second place in my class) and at the largest NPC show, the 2012 NPC "Nutrition Pit" Natural Northern USA (13th place in my class). After giving birth, I weighed 208 pounds. I was horrified at that number and because I gave birth via caesarean section I wasn't able to lift or run for six weeks. When the doctor cleared me, I started doing cardio twice per day for 30-60 minutes. I was determined to reach my goals and compete again. It wasn't easy, but I pushed myself by making a collage of my goals and motivational pictures and quotes. When I thought I couldn't do it, I looked at the collage. After I lost a few pounds and increased my endurance, I returned to the gym. I started out with 2-3 days per week and then went 4-5 days per week when I got back into the swing of things. Many people asked how I managed to go to the gym and work so hard when I had twins at home who were just a few weeks old. I actually found it somewhat easy and timed it perfectly. They slept in three-hour intervals and woke up every morning around 3 a.m. When they woke up, I fed them, rocked them back to sleep, and headed to the gym. It allowed just enough time for me to drive there, do my morning cardio, hit the weights, and drive home. My husband was always home to watch them in case they woke up at an unusual time. It was draining, but with the help of my husband I was able to rest because he knew it was important to me. Meal planning was the key to my success. Here's a sample of what my meals looked like. I made sure to consume one gallon or more of water per day. I did 30-60 minutes of cardio twice per day. The dieting was the area I struggled with most. It's hard to maintain the meal plans every day. In 2013, and in the years following, I plan to continue improving my physique until I reach my ultimate goal and become an IFBB pro athlete. Anything is possible if you put your heart into it and stay dedicated. If you don't know exactly what to do or where to start, there are plenty of resources and trainers out there who are full of help. I used Bodybuilding.com to purchase my supplements and competition tanning products. I also utilized the articles about other transformations and competition prep advice. Bodybuilding.com is a great resource.